Hammurabi and His Code of Laws - WHO WAS HAMMURABI? 6. WHERE IS HAMMURABI'S STELE TODAY? Hammurabi was an Amorite - a member of a Semitic group of people who settled in Mesopotamia in about 2000 BC. 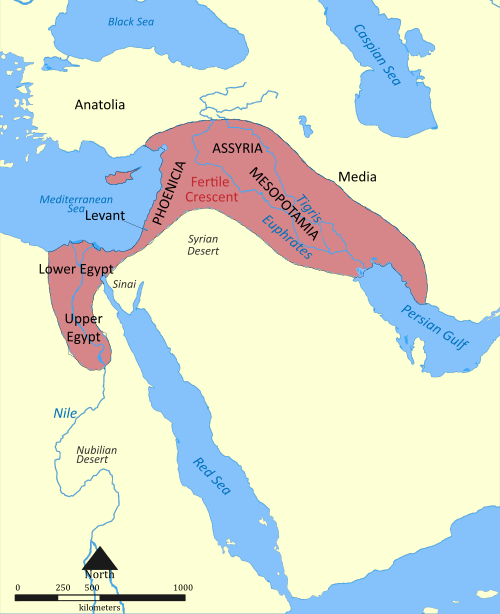 Today, we refer to their part of the world as the "Fertile Crescent." It is the area between the Tigris and Euphrates as those rivers flow out of the Persian Gulf. Because the Tigris and Euphrates Rivers provide such fertile farmland, people have always wanted to live there. Ur, the city of Abraham and the capital of Sumer in the southern region of Mesopotamia, was thriving by the year 2000 BC. About 200,000 people lived in Ur at that time. Archeological digs give us some evidence what people in Sumer looked like. Here, from the Oriental Institute at the University of Chicago, is a Sumerian gentleman. Babylon, which is about 55 miles south of today's Baghdad, was an even larger city by 1750 BC. When Hammurabi became ruler of Babylon (about the time Abraham left Ur for his journey to Canaan), the people of the Fertile Crescent were not unified under a single government. The Tigris-Euphrates cities independently governed themselves. Hammurabi systematically unified the entire region to create an empire. Today we call the territory ruled by Hammurabi "The Old Babylonian Empire." But what was life like in Babylon? What language did the people speak? What religion did they practice? Let's take a look at the evidence they left behind. Bos, Carole "WHO WAS HAMMURABI?" AwesomeStories.com. Oct 01, 1999. Apr 19, 2019.